First off, do y'all even have a clue how hard it was for me to keep this news to myself for 16 weeks?! I'm a gal who loves to share happy news, so I had to temper my excitement! We are so excited that our newest little daughter, Ainsley Catherine Sisti, will be joining us in mid-December! Yes, this baby was a surprise to us. Caroline and Ainsley will be 14 months apart. No, we did not "plan" it. But God did. And by now, I think the guy knows what He's doing. We definitely wanted at least one more child and hoped she/he would be really close in age to Caroline. We had already discussed trying again when Caroline turned a year old. Turns out, the good Lord beat us to the punch by about three or four months. I went through so many emotions that first week. My initial reaction upon seeing the test was...to laugh. (When I'm nervous, I laugh. A lot.) So, there I was, laughing like a buffoon all by my lonesome while Caroline napped and Ruby (our mini dachshund) staring at me like I was a lunatic. And then I was like, "Maybe I should do another test to confirm?" So, I drove to the drugstore once Caroline finished napping, bought a three-pack and headed back home. After another test, it became clear that the test was indeed correct. So I picked up the phone, called Stephen with shaking hands and we started laughing together on the phone. Then, I immediately called my Mom. She was thrilled and had to try like the dickens to keep her composure since she was in a doctor's office waiting room, ha! I was thrilled. And terrified. But mostly exuberant. But kind of in shock. And really happy. But OH-MY-GAWWWWWWW. That night we found out, I started to get a little worried as emotions set in and pregnancy hormones reared their ugly heads. The thought of having a newborn and a really young toddler at the same time kind of freaked me out. I was SO excited to be a mommy again, but I began to question my ability to care for two. "Would I have the energy?" "Am I a 'good enough' mom to do this again so soon?" "What if I can't give Caroline the attention she needs and deserves with a newborn to look after?" So. Many. Thoughts. But, my husband, always the voice of reason, reassured me that we would rock this thing. After I prayed, took a good, long shower, and had a restful night of sleep, I felt much more at peace. And that next morning, I was able to relax and focus on just celebrating the little blessing that would soon be joining us. 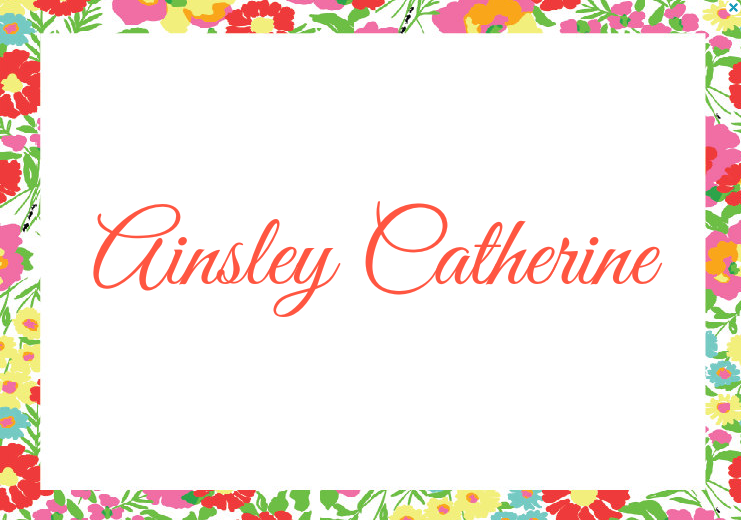 There really isn't a significant reason for choosing the name we did -- Ainsley Catherine -- only that we just liked that name a lot. We considered Catherine for the first name, but Stephen has quite a few Catherine(s) in his family already. I heard the name Ainsley, loved it, threw it out to see what Stephen thought, he loved it and it stuck. Will I do a week-by-week Bumpdate? I don’t think so. I’ll take some pics for my own records and be journaling everything in this baby's book, but I’m not going to bore y’all with weekly updates. Maybe monthly? To be honest, I'm too busy chasing the babe I have now! But to give y'all a reference point as to what le bump looks like now, this is me at 16 weeks on July 3rd. I'll be 17 weeks this Wednesday. Have I been sick as a dog like I was with Cee Baby? Right now, I might get sick once or twice a day, but after the hyperemesis (or HG) pregnancy I had with her, this is a walk in the friggin' park. I was DYING to know the gender and, as much as I love the idea of being surprised at the birth, I'm just too much of a planner. So, when they asked if we wanted to know, we said YES. I've always just had a feeling I'd be a girl mom. It's funny because a lot of people assumed Stephen would want a boy, but his loyalty was always with Team Pink. (He's pretty smitten with the little gal we have and, when asked, he was pretty up front about wanting another daughter.) He's also ecstatic that we won't need to do any clothes shopping, ha! Just like with Caroline, I cannot eat sweets. I had a Sonic milkshake one day at work and spent the majority of the afternoon throwing up off and on. However, I've been eating my weight in salty stuff: chips, salsa, queso, salt and vinegar potato chips, anything smothered in ranch dressing and baked potatoes. Also, I am eating spicy food like my life depends on it. I bought a gigantic container of Cajun blackening spice and have been putting it on everything from shrimp to grilled chicken. Dresses and tops are still non-maternity, but that's because most styles are pretty flowy and easily accommodate the growing tummy. Two babes this close together is going to be a whole lot of work, but I will update as much as possible on here after the second bebe arrives. I’d love to say the content won’t change, but I’ve always blogged about my life - whatever season it happens to be in. So, of course it will change a bit. I'd say if the occasional baby post or baby photo offends or bores you, you will probably need to find new online reading material ; ) (Hey, just being honest.) But, I'll try my best to keep the content not too mommy-ish. Is this why we’re moving? Ha!! No, but it certainly solidified our decision! We really wanted a bigger place anyway, and ironically, had already met with the realtor and began crafting up the listing agreement before we got the positive pregnancy test. But now I’m VERY glad we have sold the house and will be moving on to larger digs. I think that’s about it! Right now things are pretty uneventful and we are ever-so-thankful for that. Hopefully within the next couple of days, I’ll get a chance to post more bump pics here or on Instagram (username: ablondeambition). Right now, I have a wonky looking bump, which looks more like I've eaten too much pizza and less like I'm a woman with child. Again, I really appreciate your support and well-wishes for this new baby GIRL. On behalf of our family, THANK YOU! i LOVE that name! so beautiful. congrats!! Congrats! Cannot wait to read up on this journey of yours. My sisters are 15 months apart for each other, and now at 14 and 15, they are still best friends. Also, LOVE the name!! Congratulations! This is so very exciting for you!!! Can't wait to hear more updates. I would love to read baby updates like before, but I understand if you dont. It is the perfect way to have kids, close together is what I would have done as well. Our second baby is due in mid-December too, the 17th in fact! We haven't found out the gender yet, but plan to very soon. Love that name! We had hoped our babies would be that close in age, but God had other plans, and they will be right at three years apart. Congratulations! My sister and I are 14 months apart as well. It works out great for sharing things like clothes, shoes, etc. My sister was a larger baby and I was small so many people thought we might have been fraternal twins. So excited for you! Congratulations, pretty girl! Fantastic news and praise God! This is wonderful news! I am so happy for you and your sweet family! I can't wait to watch you rock maternity clothes and life with two little ones! What a blessing! Oh how exciting!!! I have a sister and we are close in age and I love it :) You picked a beautiful name, that's one of the names I have picked out for my future children! Congrats! So excited for you! My cousin has girls 16 months apart, and at ages 7 and 8, they practically look like twins. (They are expecting a little brother right now, though, so never say never!) What I had been wondering since your initial announcement was whether they are detecting gender earlier these days, since you are the second person I've seen lately announcing the gender at the same time as the pregnancy. The "big" ultrasound was at five months when we had our first six years ago, and I guess four months for our second three years ago. Is it still four months or did you find out earlier? We're trying for our third now. I want three girls, but my husband is rooting for a boy! Congratulations! How much fun for them to be so close growing up! Congratulations! So cool that they are so close in age! 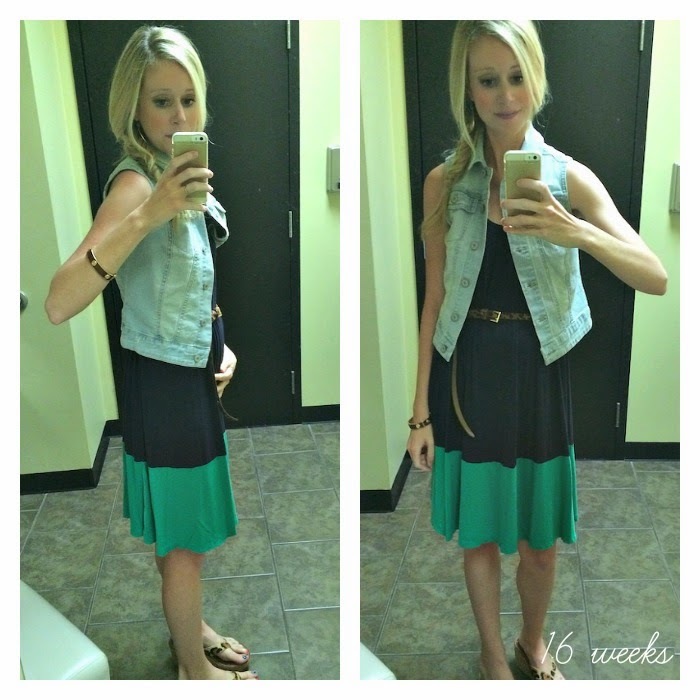 I wentg back and compared your 16 week picture when pregnant with Caroline to this one. So different. Congratulations!! I have an 8.5 month old and have a major case of baby fever!! What a cute baby bump! I am just elated for your, Leslie! I can't wait to experience what you have with Caroline & soon to be Ainsley! The Good Lord knows what we need and it's all in His timing! Congratulations! Best wishes to you and your family! Congrats! My two boys are 15 months a part and I would not have had it any other way! You are giving sweet Caroline the BEST GIFT EVER!!!! My sister is 14 months older than me (we are now 27 & 28) and we are inseparable.